How tall will my plant grow? And how long will it take? 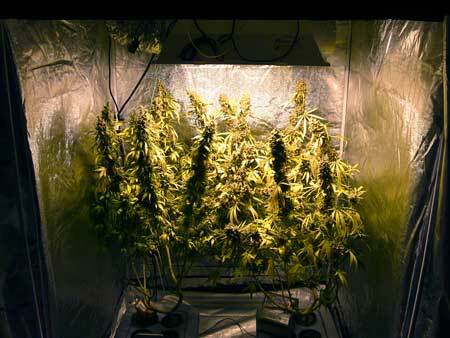 Question: How tall should I expect my marijuana plants to get? And how long does it take until harvest? How long will my marijuana plant take to grow? How long from seed to harvest? It will be 8 weeks – 6+ Months before your plants are ready to harvest. But that's a huge range, right? Inside or Outside – In general, outdoor plants need longer to harvest than indoor plants. Outdoors, you plant in the spring, and harvest in late fall, taking 5-6 months or more. Indoors you have more control over the plant and can choose how long you want your plants to grow before harvest, and can get to harvest in just a few months. Indoors you can also start growing at any time (you don't have to wait until Spring to start growing). Strain – Some strains tend to have shorter lives, and others need longer before they're ready to harvest. 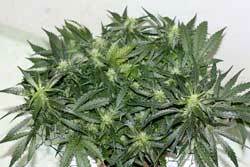 For example, you can choose to grow an auto-flowering strain to get to harvest in as short as 8 weeks. 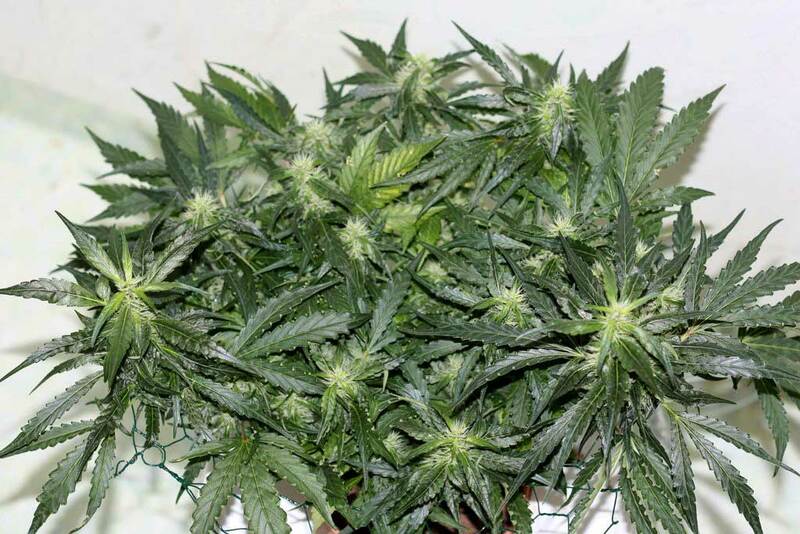 But many strains which originated near the equator can take months and months before their buds are ready to harvest, even when growing indoors. So strain is important when it comes to time-to-harvest. Desired Yields – If you want bigger yields, you need a bigger plant, and that takes more time to grow than a small one. 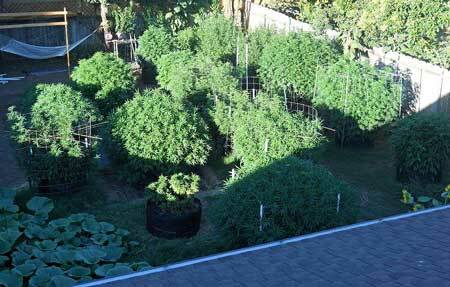 How tall will my marijuana plants get? Plants can be grown shorter than your knees, or taller than your house. Basically you (the grower) are in complete control of how tall your cannabis plants grow. This is especially true for indoor growers, where you are in charge of nearly everything. When growing outdoors, you still have a bit of control over plant height, but you are also at the mercy of the sun and the elements. 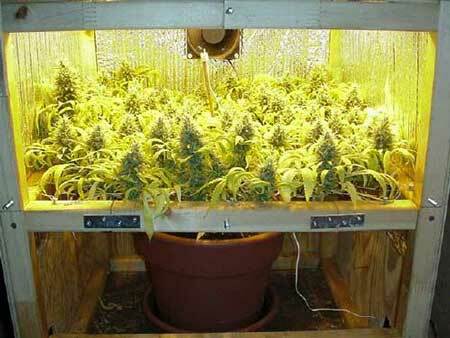 Some strains tend to grow tall and thin, while others tend to grow short and squat, but you can force your plant to grow differently when growing cannabis indoors. In fact, you have many options to control the exact shape and size of your plant. To learn about all the tools and techniques you have available to control the height and shape of your plant, take a look at our Plant Training & Height Control guide! Short plant in a small space – this plant is only about two feet tall thanks to training with a screen, yet still producing lots of bud! You don't need a huge space to get a good harvest when you use plant training. 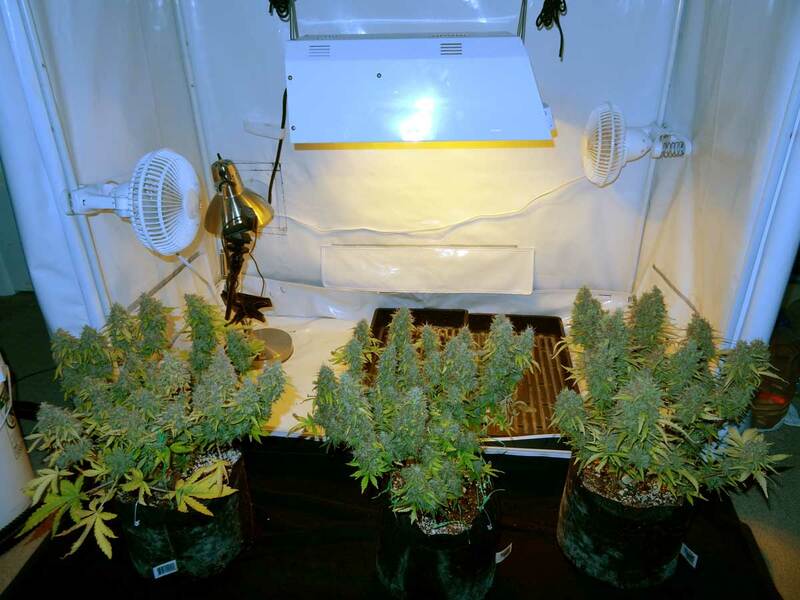 These cannabis plants were also trained to stay short, this time using LST – they were under two feet tall at harvest and produced more than 6 ounces of bud under a small grow light! These plants were trained using manifolding. They were about 5 feet tall at harvest, and produced more than a pound of bud! You can achieve almost any size or shape when growing indoors as long as you use plant training. But if a cannabis plant is left to grow outside with tons of sun and without any plant training, the sky is the limit for how big they can get! Although it isn't the be-all end-all when it comes to size, strain is still definitely something to keep in mind when it comes to height. Although you can control the exact height and shape of your plant no matter what the strain with plant training, different strains grow differently and you want a strain that makes it easier to get the results you want. When growing with bagseed (seeds that you find in your buds) you often don't know what to expect until the plant actually starts growing. For example, some strains (known as "indica" strains tend to stay short, while "sativa" strains tend to grow tall). Just to give you an idea of the difference, these plants were grown in the exact same setup. To fight these natural tendencies and force these plants to be the same height, the grower would have needed to use different techniques and training strategies. If the grower had wanted to make the right plant shorter, the plant would have needed more Low Stress Training and Supercropping. 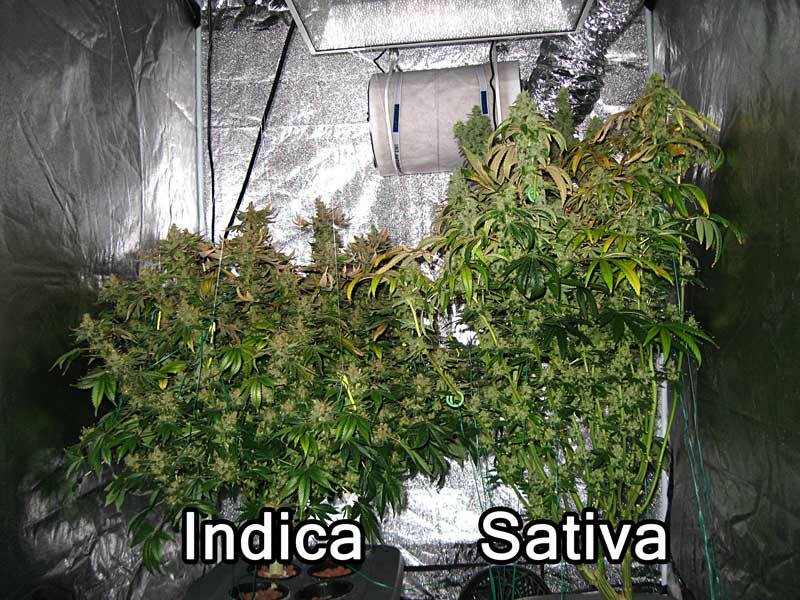 For the left plant to grow taller, the grower would have needed to give the plant more time, since indicas tend to stay short. So even though you can force plants to grow into any size and shape, it's often easier to start with a strain that naturally grows the way you want. That way your plant is working with you instead of against you. Learn how to find the right strain for your needs. Learn more about how to get your plants to grow the size and height you want! 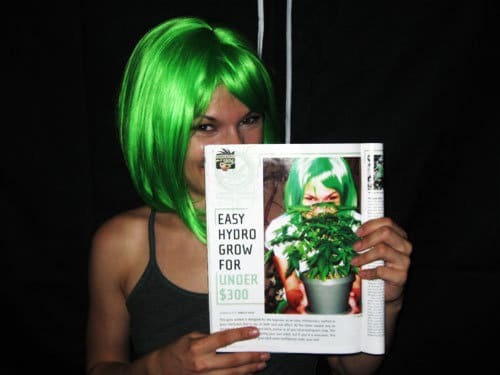 Since then, Nebula has published hundreds of growing articles in print and online, and continues to dedicate herself to serving the medical marijuana growing community. "My mission is to show other medical marijuana patients how easy it can be to grow weed out of your closet." Please don't hesitate to Contact GrowWeedEasy.com with any questions. Teach Me the Basics of Growing Weed! 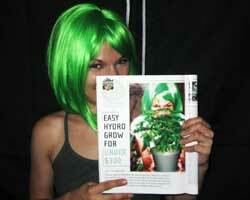 How Do I Train My Cannabis Plants? What's the Fastest Way to Grow Marijuana?